Henry Kietzman ’14 (left) and Rose Pitkin ’14 have worked to provide a foundation for future LGBT student-athletes to thrive on campus. While many of her classmates were in McCabe Library preparing for finals, Rose Pitkin ’14 was holed up in the Lamb-Miller Field House with only one focus—finishing a Swarthmore athletics department You Can Play video. Sponsored by the You Can Play Project, which seeks to rid college athletics of homophobia, the video represents the department’s attempt to join many professional and collegiate teams in letting LGBT (lesbian, gay, bisexual, and transgender) athletes know that fair play for all is what matters. Pitkin juggled several roles in the film production: director, scriptwriter, editor, and producer, to name a few. She recruited 12 student-athletes (one from nearly every varsity team), five coaches, the department’s front office staff, and President Rebecca Chopp to pledge their support for equal treatment of athletes. “It’s important to know that your department is behind you,” says Pitkin, who completed the video before graduation. While professional and college sports are finally beginning to embrace openly gay athletes, the effort to equal the playing field for LGBT athletes is also well underway at Swarthmore—thanks in part to Pitkin and other dedicated students. A four-year starter for the softball team, Pitkin has been a steady presence in the athletics department, serving as the student-athlete advisory committee (SAAC) president and even donning the Phineas the Phoenix costume at games. Well-known for being headstrong but earnest, Pitkin has been a vocal advocate for all student-athletes since arriving in 2010. But her advocacy for LGBT student-athletes like herself grew after she attended the first Nike LGBT Sports Summit in Portland, Ore., in June 2013. Pitkin represented GO! Athletes, the nation’s largest network of current and former LGBT athletes and coaches. In Portland, her eyes were opened to a powerful movement of LGBT athletes and their allies who were fighting for equality in athletics. Pitkin returned from Portland committed to enhancing the athletics department’s efforts to support LGBT student-athletes. This spring, she joined forces with fellow student-athletes and met with Associate Director of Athletics Nnenna Akotaobi. She praises Akotaobi for supporting diversity in athletics and the initiatives Pitkin has designed to enlighten the Swarthmore community on the challenges of being an LGBT athlete, which includes encounters with homophobic language. Pitkin hopes to make people more aware of how much inappropriate words can hurt. One of Pitkin and company’s first endeavors—scoring a Sager Fund grant—brought to campus Jeff Sheng’s Fearless Project, a photo and video exhibit of college and high school LGBT athletes. Photos were displayed in the field house lobby for six weeks, and Sheng gave a lecture and added photos of Swarthmore LGBT student-athletes to the series. “The goal was to break down stereotypes in athletics,” says Pitkin, who was one of five Swarthmore student-athletes whom Sheng photographed. While the Fearless Project and the You Can Play video are the highest profile initiatives from the last year, others—which include creating an allyship resource guide for the athletics department and lunch-and-learn conversations with student-athletes from underrepresented populations—were just as impactful. Henry Kietzman ’14, a student-athlete photographed for the Fearless Project and four-year member of the men’s swim team, believes the department’s new initiatives will not only showcase Swarthmore as a place where everyone can feel safe to play but will educate teammates and coaches on some of the daily challenges that LGBT athletes face. “All these projects have served to initiate conversations with my teammates,” says Kietzman, who came out to his teammates during his first two years of college. 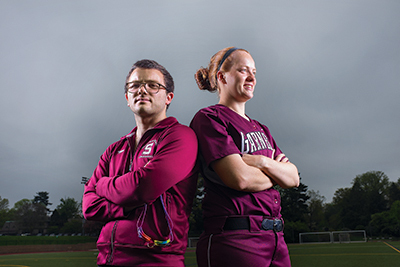 Although they will no longer wear the Garnet uniform, Pitkin and Kietzman have provided a foundation for future LGBT student-athletes to thrive at Swarthmore and for the College to stand out as a leader against discrimination in college athletics. “I don’t think it will happen quickly, but if places like Swarthmore can be pioneers and wholeheartedly join this movement in athletics, I think the rest of the nation will follow,” says Kietzman.